Much of your garden waste is biodegradable which means that you can easily make it into compost to re-use in your garden. Grass and flower cuttings alongside food waste are ideal for this purpose. You can make your own bin with posts and netting or choose from a range of bins designed especially. It’s best to start in the spring! Place woody materials at the base and add layers of different materials at regular intervals. The bin will heat up as it gets full and contents will need turning and watering to ensure ready compost in less than 4 months. It won’t be practical to dispose of all waste this way. Materials such as bricks and rubble can’t be composted. Larger amounts can be taken to your local tip or you could look into hiring a skip, but remember these can be awkward to load. You could hire a van to deal with several journeys to and from the tip if your vehicle isn’t suitable. Depending on your local council it may be possible to have up to five bags of garden waste collected each week free of charge but it must be tied in refuse sacks. Otherwise a chargeable collection will be made. It’s quite straight forward to make an appointment for the team to come and visit you for free. You can telephone or use their online form or website. You’ll be given a quote onsite and once the price is agreed your waste will be loaded and removed. All the technicians are vetted and wear uniforms, and will come in fully equipped vans armed and ready to help. In the long run this could be the most cost-effective method of disposing of your garden waste without getting your hands at all dirty! 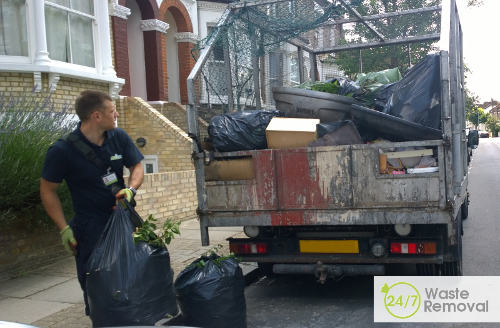 This entry was posted in "24/7 Waste Removal Tips" "Waste Management" on Tuesday, October 28th, 2014 by 24/7 Waste Removal.